The leading candidates for the U.S. House of Representatives face off in a debate on VPR Wednesday, October 22 at 7 p.m. Bob Kinzel moderates a debate among Democrat Peter Welch, Progressive Thomas Hermann and Jane Newton of the Liberty Union Party. They focus on the key issues facing Congress, including the bailout package and the War in Iraq, and they’ll answer your questions. Listen to the live debate, Wednesday, October 22 at 7pm on VPR. 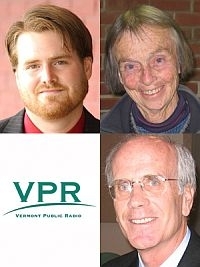 Listen to all the VPR Debates from Campaign 2008 and check out the Profiles of the candidates for office.